Therefore, we’re taking you on a guided tour of 3430 Masson, a new condo development in the Rosemont-La Petite-Patrie borough. Everyone knows the Botanical Gardens, the Biodôme and the Olympic Park, but Masson has much more to offer. An area abounding with a multitude of pleasures waiting to be discovered. The following three addresses will give you a taste of what it is like to live in this area. A 5-minute walk along Promenade Masson and you come upon the Café Lézard. This combination bistro, restaurant and bar often showcases diverse cultural events. The homemade food is delicious accompanied by a Quebec beer while appreciating the works of bloggers, photographers and tattoo artists adorning the walls. Come nightfall, the café is the ideal spot to host live musical performances in its intimate and relaxed setting. Before heading home, be sure buy a bag of coffee. 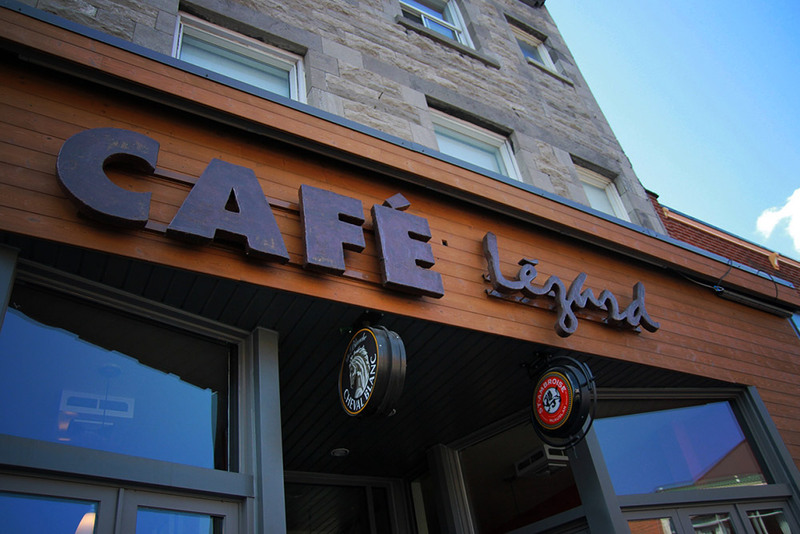 With the café’s selection of fair trade, organic coffees, you will surely find a favourite! A bit further away, also on Masson, is Pelican Park where you will be greeted by… sheep! 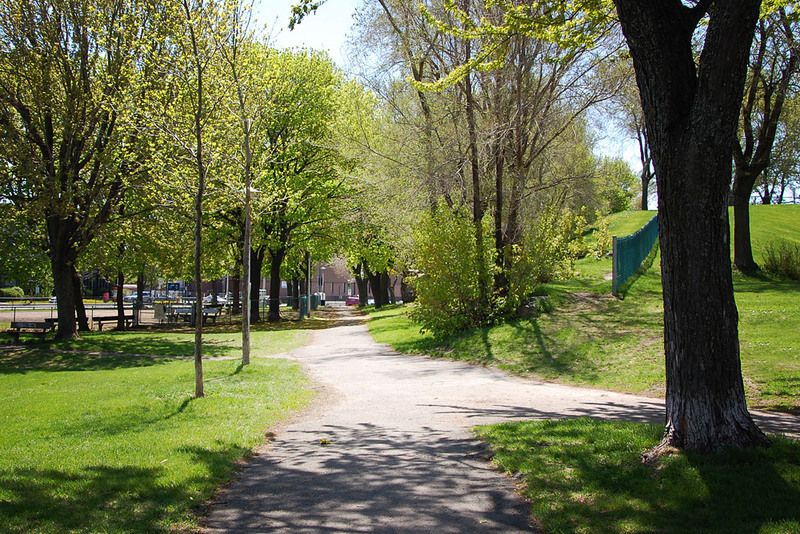 Throughout most of the summer, Pelican Park hosts a project called “Biquette à Montréal”. This program’s goal is to increase awareness regarding sustainable development, urban agriculture and, most importantly, what goes on our plate. The sheep make this an interactive and fun space, perfect for picnics, food tastings and movie and documentary screenings. Interesting tidbit: the sheep are part of an eco-pasture project, common in Europe and the United States, in other words, the sheep mow the lawn and… feed the soil! When visiting the park in the winter, be sure to enjoy a leisurely skate or a game of pickup hockey on the outdoor rink. We continue our guided tour with the Angus Shops located on the other side of Pelican Park. Once, Canadian Pacific Railway facilities, today these warehouses are part of an urban renewal project. Among the many businesses within this mini-neighbourhood is the Hoogan & Beaufort restaurant with its terrace that is ideal for Sunday morning brunch and mimosa. The Mamie Clafoutis artisan bakery is a fantastic location to hang out and converse over fresh out of the oven croissants. 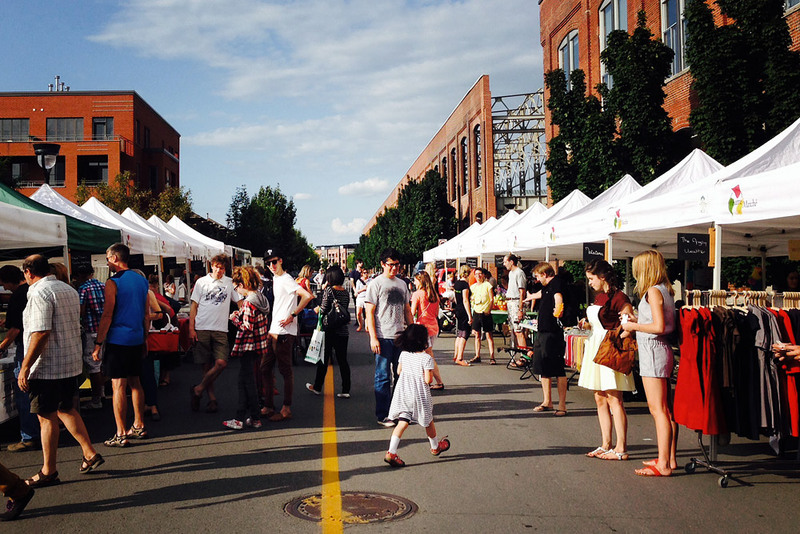 In the summer, hundreds of people stroll along the sidewalks perusing the food vendors and artisan kiosks. One of the most popular, the Etsy craft market, features the unique and locally made wares of Montréal artists. There you go. You’re ready to become a hip resident of 3430 Masson. Now, move in and discover your own hidden gems.